She is never absent and comes always on time. I can’t read his writing for it is too bad. She is punctual and regular. I can’t read his cacography. You see we have rewritten the above examples in concise way so that they give exactly the same meanings. This is how the whole paragraph may be written with brevity. There are some important points that need to be considered while writing précis. 1. Remember, précis must not be discursive rather it should be continuous essay. 2. All the important ideas must be taken into account. Avoid all those details that don’t contribute the main stream of the passage. 3. Try to combine all examples or similar event into one statement. 4. You can either extend or reduce not more than FIVE words in your précis, because when you reach the required number of words you may be at the mid of sentence and therefore need few words to complete your sentence. First you have to do some mathematical work. Count the words in one line of the given paragraph. Multiply the number of words (in one line) with the number of line. Now you have total number of words and this must be divided by three and the figure you got is the number of words you have to write in your précis. Remember, you can extend or reduce this figure by five words because when you reach the required words in your précis you may be at the mid of sentence and you need some more words to complete it. Start writing précis and count the number of words you have written in one line. 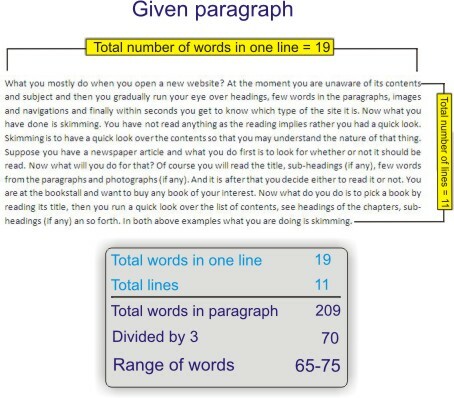 Now count the lines upto which the required number of words may be reached and put some dot or any mark so that you may recognize that you must not go beyond that point. Try to collect all the similar things, like; examples, events etc and express them in one statement. Don’t talk about them separately.